The Cauldron is one of the greatest jackets I've ever owned in regards to quality workmanship and all-around diversity. With its very reasonable price tag, even in this dark economic climate, you can probably find enough change in the pay phones around Boulder to get one at Neptune’s Mountaineering shop. The Cauldron is great for skiing, cragging and alpine climbing, but still looks nice enough to wear out on a hot date to the Mountain Sun on a Friday night. For its weight and volume, the Cauldron is surprisingly warm and I've spent many comfortable 15-55 degree days wearing it. Weighing in at a miniscule 1.1 lbs, it’s almost invisible in a pack: stuffed, it can fit into most beer pitchers...(not that you'd want to do that; it's just a point of reference). There jacket has just the right number of pockets, which are all just the right size and just in the right places. The two external side pockets have girth-hitched pull extensions that make access easier when wearing gloves. (The lack of which is one of my pet peeves. In fact, the only thing I’d like to see in future versions of the Cauldron is an addition of those same extensions on the other pockets). The elastic hem draw cord increases core warmth and tightening it up keeps the jacket clear of harness gear loops when climbing, allowing for easy access to gear for those desperate clips and placements. The Dri-Clime lined collar is snug enough to retain warmth, but still loose enough to allow for unrestricted neck movement, and the Angel-Wing design really does keep the jacket from riding up during extended periods of over-the-head movement. I conducted my own SEQCT (Severe Elements Quality Control Test) on the Cauldron jacket, the results confirmed by no less than 3 independent agents. I gave the jacket to my 3 year-old to play with when I felt I could part with it on an especially warm day. When I got home that night, the jacket was unscathed, with its zippers all in perfect condition, its loft retained, and the elastic as good as new. It had categorically rebuffed all the damage such a test normally inflicts. 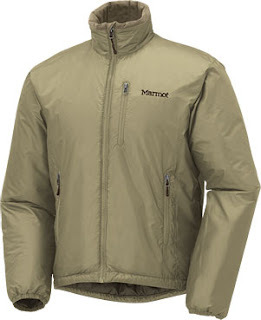 These results are remarkable, and speak volumes about Marmot’s lofty attention to quality. (pardon the pun). Marmot truly seems to be built by those who do what we do, so they know what we need, and they have delivered with the Cauldron jacket. Start gathering your pennies, and head over to your local mountaineering store and pick one up...even in this aforementioned dark economic climate. You can check out more details of the Cauldron here. I looked here when I needed a hearing aid services.